What’s the normal course load at Smith? In order to graduate from Smith with a bachelor of arts degree, a student has to earn 128 credits. Thirty-six to 48 of these credits must be chosen to satisfy the requirements of the major field; 64 credits must be chosen from outside the major department. First-year students must take a writing intensive course, chosen from a number of options. In order to graduate with Latin Honors a student must elect at least one course in each of the seven fields of knowledge: literature, historical studies, social science, natural science, mathematics and analytical philosophy, the arts and foreign language. The requirements differ for those who choose to seek a bachelor of science in engineering. A major must be declared during the fall or spring of sophomore year, or before a student begins her junior year. How many majors are offered? Smith offers 36 departmental major fields and 12 interdepartmental majors, 39 departmental minors and 20 interdepartmental minors. There are 10 academic concentrations, which give you a way to organize a combination of intellectual and practical experiences around an area of interest. While not an easy process, if a student wants to design her own major she may do so. She must obtain the approval of the Subcommittee on Honors and Independent Programs of the Committee on Academic Policy. Student-designed majors must differ significantly from existing majors. The average class size is 19. The student/faculty ratio is 9 to 1. Students interact with their faculty both in and out of the classroom. Faculty hold office hours during which students visit with questions about class. Faculty are also available by individual appointment. Many students and faculty interact in non-academic arenas including over meals and tea in student houses. New students select their classes during orientation, which takes place the week before school begins. Every first-year student is assigned a Liberal Arts Adviser. Your adviser will have from eight to 10 advisees and will remain your adviser until you declare your major and ask a faculty member in your major department to be your adviser. During orientation your Liberal Arts Adviser will talk with you about your interests and goals and help you select a workable course load from the more than 1,000 courses we offer. What are the most popular majors at Smith? Economics, psychology, government, biology and art. Smith offers a wide range of study abroad programs, from the Smith-run programs in western Europe to Smith-affiliated and Smith-approved programs all over the world. 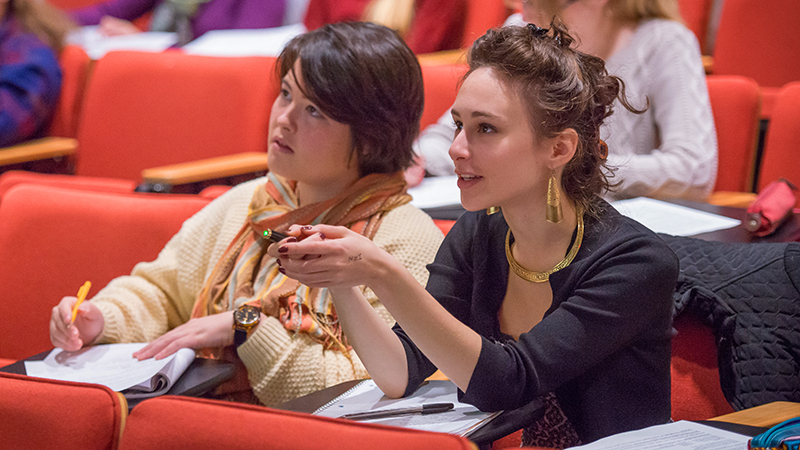 Smith faculty direct programs in Florence, Hamburg, Geneva and Paris. Each of these programs is for a full academic year. Smith also has a formal affiliation with programs in Japan, China, Rome, Spain, South India and Russia. Students may also arrange to study abroad on one of over 100 additional programs that have been approved by Smith. Students participating in Smith-approved international study programs are billed and financial aid is available to them as if they are on campus. Smith will pay the study abroad program tuition and fees directly to the program. Students are responsible for all expenses and all travel during vacations.